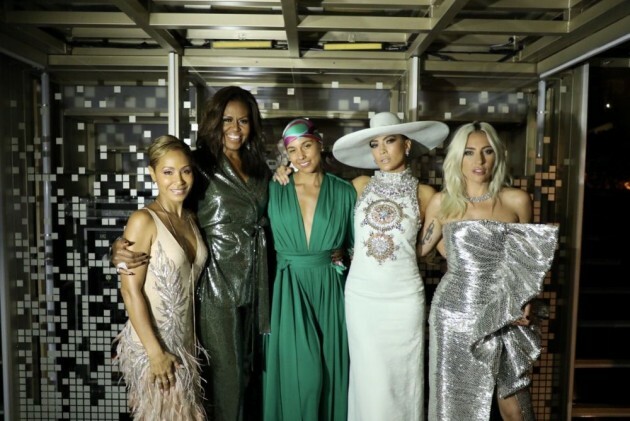 Former First Lady Michelle Obama made a surprise appearance at the 2019 Grammys to support the host of the ceremony Alicia Keys and discuss the important role music has played in her life. Keys introduced the segment saying, "Music is what we all love, music is what it’s all about. Everybody is out here shining and I’m so proud to bring us together to honour this moment because music is what we cry too, it’s what we march to, it’s what we rock to, it’s what we make love to. It’s our shared global language." "Whether we like country or rap or rock, music helps us share ourselves, our dignity and sorrows, our hopes and joys. It allows us to hear one another, to invite each other in. Music shows us that all of it matters — every story within every voice, every note within every song," Obama said. After the awards ceremony, she posted a group photograph on Instagram and said as a friend she always makes sure to be with her "girls" at every point in their lives. "For me, a big part of friendship is showing up for your girls—whether that’s for a birthday, a quick catch-up after work, or a major milestone. "So I was thrilled to be there for the one and only @aliciakeys at the #GRAMMYs. She is one of the most genuine, caring, and thoughtful people I know—there’s no one better to help us all celebrate the unifying power of music," Obama captioned the photo. Keys was announced as the host of the ceremony last month.